What is an electrical machine? An electrical machine is a device which converts mechanical energy into electrical energy or vice versa. Electrical machines also include transformers, which do not actually make conversion between mechanical and electrical form but they convert AC current from one voltage level to another voltage level. 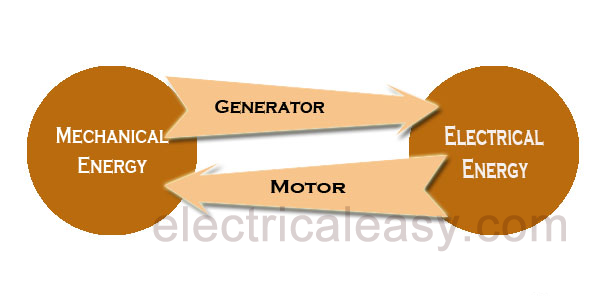 An electric generator is an electrical machine which converts mechanical energy into electrical energy. A generator works on the principle of electromagnetic induction. It states that whenever a conductor moves in a magnetic field, an emf gets induced within the conductor. This phenomenon is called as generator action. A generator basically consists of a stator and a rotor. Mechanical energy is provided to the rotor of a generator by means of a prime mover (i.e. a turbine). Turbines are of different types like steam turbine, water turbine, wind turbine etc. Mechanical energy can also be provided by IC engines or similar other sources. To learn more about how generators work, read the following articles. A motor is an electrical machine which converts electrical energy into mechanical energy. When a current carrying conductor is placed in a magnetic field, the conductor experiences a mechanical force and this is the principle behind motoring action. Just like generators, motors also consist of two basic parts, stator and rotor. In many types of motors, electric supply needs to be provided for both stator and rotor winding. But in some types, like fixed magnet motors and induction motors, supply may be necessary for only one winding. Electromagnetic force between the two windings causes the rotor to rotate. To learn more about electric motors, read the following articles. Transformers do not actually make conversion between mechanical and electrical energy, but they transfer electric power from one circuit to another circuit. They can increase or decrease (step-up or step-down) the voltage while transferring the power without changing the frequency, but with the corresponding decrease or increase in the current. Input power and output power of an electrical transformer should ideally be the same. Step up transformers increases the voltage level from primary to secondary but with the corresponding decrease in the current. Whereas, step-down transformer decrease the voltage level with the corresponding increase in the current so as to keep the power constant.